In the honeybee, Dufour's gland secretion is caste specific and constitutes a component of the multi-sourced queen signal. As predicted, it is attractive to workers, which form a retinue around the scented source. Bioassays reveal the ester fraction and not the hydrocarbons to be the active constituents. This function of the esters was corroborated by assays with the synthetic queen-esters mixture, which successfully mimicked the queen's secretion. As predicted from the queen-like secretion exhibited by egg-laying workers, their glandular secretion was also attractive to nestmates, albeit to a lesser degree than that of the queen; while that of non-egg-laying workers was totally inactive. 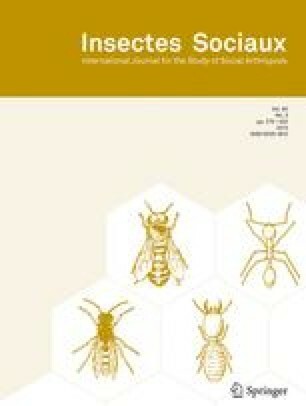 The evolution of the multiple queen signals in honeybees can be regarded as a component in an arms race between queen and workers. We hypothesize that in response to a reduced sensitivity to a certain queen signal, queen honeybees were selected to develop an alternative signaling-source. Dufour's gland seems to be one of these sources. Key words: Dufour's gland, esters, honeybees, Apis mellifera, attraction. Received 2 May 2002; revised 31 July 2002; accepted 12 August 2002.